Translated on Imperial command by the T’ang Dynasty Tripitaka Dharma Master Prajna of Kubha. What are the ten? The first is to worship and respect all Buddhas; the second is to praise the Thus Come Ones; the third is to extensively cultivate making offerings; the fourth is to repent of karmic obstacles and reform; the fifth is to follow along with and rejoice in merit and virtue; the sixth is to request the turning of the Dharma Wheel; the seventh is to request that the Buddhas remain in the world; the eighth is to always study with the Buddhas; the ninth is to constantly accord with living beings; the tenth is to universally transfer all merit and virtue. Universal Worthy Bodhisattva told Good Wealth, “Good Man, to worship and respect all Buddhas is explained like this: All Buddhas, World Honored Ones, are as numerous as fine motes of dust in all Buddhalands in the ten directions and the three periods of time, to the exhaustion of the Dharma Realm and empty space. Because of the power of Universal Worthy Bodhisattva’s conduct and vows, I have a mind of deep faith and understanding of them as if they were before my eyes. “With my body, mouth, and mind karma completely pure, I constantly worship and respect them. “In each and every place where there are Buddhas, I manifest bodies as numerous as fine motes of dust in ineffably ineffable numbers of Buddhalands. “Each and every body everywhere worships and respects Buddhas as many as the fine motes of dust in ineffably ineffable numbers of Buddhalands. “When the realm of empty space is exhausted, my worship and respect will be exhausted. But because the realm of empty space is inexhaustible, my worship and respect will never end. In the same way, when the realms of living beings, the karma of living beings, and the afflictions of living beings are exhausted, my worship and respect will be exhausted. But the realms of living beings, the karma of living beings, and the afflictions of living beings are inexhaustible. Therefore, my worship and respect are inexhaustible. They continue in thought after thought without cease. My body, mouth, and mind never tire of doing these deeds. “Moreover, Good Man, to praise the Thus Come Ones is explained like this: In each fine mote of dust in all lands throughout the ten directions and the three periods of time, exhausting the Dharma Realm and empty space, there are Buddhas as numerous as fine motes of dust in all worlds. Each of these Buddhas is circumambulated by an ocean-wide assembly of Bodhisattvas. “With my profound and supreme understanding, I know and see them all. Each of my bodies brings forth a tongue of subtle and wonderful eloquence surpassing the skillful speech of even Sarasvati, the goddess of eloquence. Each tongue brings forth an inexhaustible sea of sounds. Each sound emits an ocean of all words, praising and glorifying all the Thus Come Ones’ sea of all merit and virtue. These praises continue without cease to the end of the boundaries of the future. Exhausting the Dharma Realm, these sounds reach everywhere. “When the realm of empty space is exhausted, when the realms of living beings are exhausted, when the karma of living beings is exhausted, and when the afflictions of living beings are exhausted, only then will my praise be exhausted. But just as the realm of empty space up to and including living beings’ afflictions are endless, so too are my praises endless. They continue in thought after thought without cease. My body, mouth, and mind never tire of doing these deeds. ten directions and the three periods of time, exhausting the Dharma Realm and the realm of empty space, there are Buddhas as many as the fine motes of dust in all worlds. Each Buddha is circumambulated by various kinds of sea-like assemblies of Bodhisattvas. With the power of Universal Worthy’s practice and vows, I am able to deeply believe in and understand them. I can know and see them all. To each I make offerings of superb and wonderful gifts. That is to say, clouds of flowers, clouds of garlands, clouds of heavenly music, clouds of divine canopies, clouds of heavenly clothing, all varieties of heavenly incense, fragrant balms, burning incense, powdered incense, and clouds of gifts such as these; each cloud is as large as Sumeru, the king of mountains. “I burn all kinds of lamps, butter lamps, oil lamps, and lamps of many fragrant oils. The wick of each lamp is as tall as Mount Sumeru; the quantity of oil in each lamp is equal in volume to the waters of the great sea. With all manner of gifts such as these, I constantly make offerings. “Good Man, of all offerings, the gift of Dharma is supreme. That is to say, the offering of cultivating according to the teachings, the offering of benefiting all living beings, the offering which gathers in all living beings, the offering of standing in for all beings to undergo their suffering, the offering of diligently cultivating good roots, the offering of not forsaking the deeds of the Bodhisattva, and the offering of not renouncing the Bodhi mind. “Good Man, the immeasurable merit and virtue created from making those offerings, when compared with the merit and virtue from a single thought of offering Dharma, does not equal one part in a hundred, one part in a thousand, one part in a hundred thousand kotis of nayutas, one part in a kala, one part by reckoning, one part by calculation, one part that can be demonstrated by comparison, or one part in an upanishad. None of them measure up to a single part. Why is this? Because all Thus Come Ones honor the Dharma. Cultivating according to the teachings gives birth to all Buddhas. If all Bodhisattvas make the offering of Dharma, they perfect the making of offerings to all Thus Come Ones. Cultivation in this manner is a true offering, a vast, great, and most supreme offering. “When the realm of empty space is exhausted, when the realms of living beings are exhausted, when the karma of living beings is exhausted, and when the afflictions of living beings come to an end, only then will my making of offerings be exhausted. Just as the realm of empty space up to and including the afflictions are endless, so too are my making of offerings endless. In thought after thought without cease, my body, mouth, and mind never weary of these deeds. “So it is that when the realm of empty space is exhausted, the realms of living beings are exhausted, the karma of living beings is exhausted, and the afflictions of living beings are exhausted, then my repentance will be exhausted. But just as the realm of empty space up to the afflictions of living beings are endless, so too my repentance and reform are endless. They continue in thought after thought without cease. My body, mouth, and mind never weary of these deeds. “Moreover, Good Man, to follow along with and rejoice in merit and virtue is explained like this: All the Buddhas, Thus Come Ones, as numerous as the fine dust motes in all the Buddhalands of the ten directions and the three periods of time, throughout the Dharma Realm and the realm of empty space, from the time of their initial resolve for all wisdom, diligently cultivated accumulation of blessings without regard for their bodies and lives. They did this throughout kalpas as many as fine motes of dust in ineffably ineffable Buddhalands. During each kalpa they gave up their heads, eyes, hands, and feet, as many times as there are dust motes in ineffably ineffable Buddhalands. “In this way, they cultivated all the difficult ascetic practices and perfected the gates of the various paramitas. They entered and were certified to each of the Bodhisattva grounds of wisdom and accomplished the unsurpassed Bodhi of all Buddhas. Upon their Parinirvana, their shariras were divided and distributed. I completely follow along with and rejoice in all of their good roots. “Moreover, as for all the different types of beings in the six paths and the four kinds of birth in every world in the ten directions, I follow along with and rejoice in their merit and virtue as well, even if it is as small as a mote of dust. I completely follow along with and rejoice in the merit and virtue of all the Sound Hearers, Pratyeka-Buddhas, Learners, and Those Beyond Study in the ten directions and the three periods of time. I follow along with and rejoice in the vast and great merit and virtue of all Bodhisattvas, who in their quest for unsurpassed, right, and equal Bodhi, cultivate measureless difficult ascetic practices. “So it is that even if the realm of empty space is exhausted, the realms of living beings are exhausted, the karma of living beings is exhausted, and the afflictions of living beings are exhausted, my following and rejoicing are endless. They continue in thought after thought without cease. My body, mouth, and mind never weary of these deeds. “Moreover, Good Man, to request the turning of the Dharma Wheel is explained like this: Within each and every fine mote of dust in the Buddhalands throughout the ten directions and the three periods of time, throughout the Dharma Realm and the realm of empty space, there are vast and great Buddhalands as many as fine motes of dust in ineffably ineffable Buddhalands. In each and every land, in thought after thought, there are all Buddhas accomplishing equal and right enlightenment, their number as many as fine motes of dust in ineffably ineffable Buddhalands. A sea-like assembly of Bodhisattvas circumambulates each Buddha. Using all manner of skillful means of body, mouth, and mind, I sincerely and diligently request that they turn the wonderful Dharma Wheel. “So it is that even if the realm of empty space is exhausted, the realms of living beings are exhausted, the karma of living beings is exhausted, and the afflictions of living beings are exhausted, my request that all Buddhas turn the proper Dharma Wheel is without end. It continues in thought after thought without cease. My body, mouth, and mind never weary of these deeds. “Moreover, Good Man, requesting that the Buddhas remain in the world is explained like this: All Buddhas, Thus Come Ones, are numerous as fine motes of dust in all Buddhalands, throughout the ten directions and the three periods of time, exhausting the Dharma Realm and the realm of empty space. When they are about to enter Parinirvana, along with all Bodhisattvas, Sound Hearers, Those Enlightened by Conditions, Learners, and Those Beyond Study, including all Good Knowing Advisors, I ask them all not to enter Nirvana. I request that they remain in the world for as many kalpas as there are fine motes of dust in all Buddhalands, bringing benefit and bliss to all living beings. “So it is that even if the realm of empty space is exhausted, the realms of living beings are exhausted, the karma of living beings is exhausted, and the afflictions of living beings are exhausted, still my requesting is endless. It continues in thought after thought without cease. My body, mouth, and mind never weary of these deeds. “Moreover, Good Man, to always study with the Buddhas is explained like this: I will be like Vairochana Thus Come One of this Saha World who, from the time he first resolved his mind, never retreated from vigor. He gave up ineffably ineffable numbers of bodies and lives. He peeled off his skin for paper, split his bones to fashion brushes, drew blood for ink, and wrote out sutras stacked as high as Mount Sumeru. Because he valued the Dharma, he did not cherish his own body or life. How much the less did he crave a king’s throne, cities, towns, palaces, gardens, groves, or any material things at all. He exerted himself to the extreme in the different kinds of difficult ascetic practices. 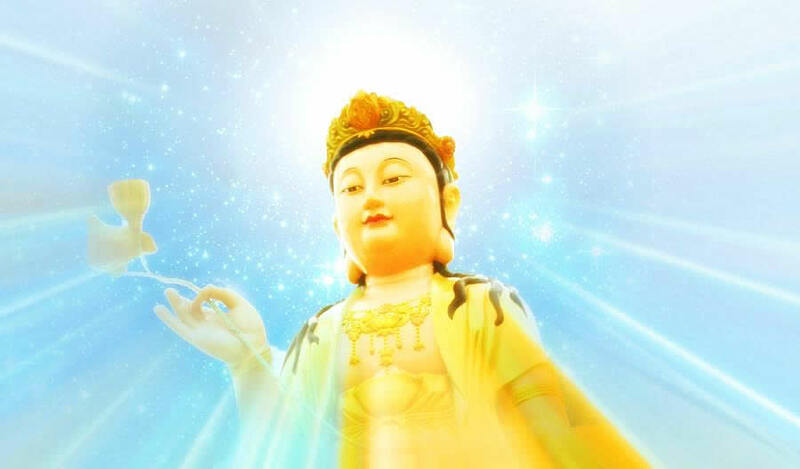 “He accomplished the Great Enlightenment beneath the tree, manifested different kinds of spiritual powers, gave rise to different kinds of transformations, made appear different kinds of Buddha bodies, and dwelled in different kinds of assemblies. He dwelled amidst the assemblies in the Bodhimandas of all great Bodhisattvas, the assemblies of Sound Hearers, the assemblies of Pratyeka-Buddhas. He dwelled amidst the assemblies in the Bodhimandas of Wheel Turning Sage Kings and the retinues of of lesser Kings. He dwelled amidst the assemblies in the Bodhimandas of Kshatriyas, Brahmans, elders and lay people, up to and including assemblies of gods, dragons, the remaining eight divisions, humans, and non-humans. As he dwelled in various different assemblies such as these, with a voice that was full and perfect like a great thunder clap, he brought all living beings to maturity according with their likes and wishes up until the time he manifested Nirvana. “In all these ways I will learn from the Buddhas, and just as it is with the present World Honored One Vairochana, so it is with all the Thus Come Ones in every dust mote in all Buddhalands in the ten directions and the three periods of time, throughout the Dharma Realm and the realm of empty space. In thought after thought I will learn from them all. “So it is that even if the realm of empty space is exhausted, the realms of living beings are exhausted, the karma of living beings is exhausted, and the afflictions of living beings are exhausted, still my study with them is without end. It continues in thought after thought without cease. My body, mouth, and mind never weary of these deeds.